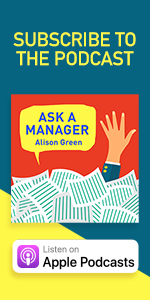 Ask a Manager: How to Navigate Clueless Colleagues, Lunch-Stealing Bosses, and the Rest of Your Life at Work will be published by Random House/Ballantine on May 1, but you can pre-order it now at Amazon, Barnes & Noble, Books-A-Million, Powell’s, and more. It’s nearly all new content that you haven’t read here, and I’m so excited about it! You can always use “Lately I Can Smell You From My Cubicle” for the sequel. That’s the first album from my AAM-themed officecore band, Wakeen and the Llamas. We’re planning to drop our first single, “Baby You Ghosted Me (But Now I’m Your Boss)” on the same day Alison’s book launches. I would so buy this and play it in my office. Don’t forget the classics “No, That’s Not Illegal” and “Wow”. Would you consider a follow-single titled “You Asked for My Liver (And I Told You No)”? I love this site. And the commentariat. You win comment of the day. Awesome letter writer or awesomest letter writer? Dammit Office Pooper, now I have your lyrics as an ear worm. Give us a warning first please?! I literally just lol’d. OP, you have been killing the comments this week! So if you’re planning an album, I hear “Nixon Potluck” would be a good title. “Lately I Can Smell You From My Cubicle” – there’s something perfect about this. I think Alison’s friend should write a guest post. Do you know when it’ll be up for pre-order on UK Amazon? We’ve sold the UK rights, so it’s coming — let me see if I can find out when! *cough* I mean, yeah, cool, I might have a look then. Congratulations on your book; that’s awesome! Congratulations! I’ll be excited to get this. Also, I’m extremely amused that the post about the coworker with the x-rated book is a related post… Perhaps we should be imagining the sensual touch of the paper against our wrists as we turn each page, eagerly exploring the perfect scripts for speaking to our colleagues? Was totally coming here to say that. LOL! I laughed at that too! Yowza, new content you say? or an ASMR-inducing version with whispered queries and soft crinkly page turns? Yay! Can’t wait to buy this. And I love the artwork (and your alternate, un-used title too!). I pre-ordered two copies. One for me, and one for my desk drawer for when I need to maybe pass along some of the good advice. Is it just US Amazon, or Canada too? My phone is having issues with pulling it up. You should be able to order from Amazon.ca, Kobo, Chapters/Indigo, or any independent bookstore at this point. As a former employee, love that you published with Penguin Random House! Ordered one copy for now–I feel like I should lay in a stock of these for future gifts though. Just a note that you can also let your local library know you’d be interested in ordering the book which will trigger them to order it. Can I just say that the suggested links for this post are great? Especially the first two. Is there any possibility of (discounted) bulk orders? This could be a cool gift for my whole team. Thank you! I’ll check with our company library as I bet they know how this would work for us. Check with your local bookstore! Many stores will give you a discount for bulk orders. Otherwise, absolutely yes to the preorder. Congrats! :D Preordered a paper copy and may come back for a Kindle one. :) Thanks for all that you do, Alison, and congratulations! I’m amused that the first related post link is the one about co-worker publishing an X-rated book. I don’t know, with some of the letters Alison gets… Quack quack, is all I’m going to say. So exciting! Do you narrate the audiobook yourself? There’s no decision yet on who will narrate (but that would be pretty cool). I kind of like the idea of Amy Schumer narrating this. I don’t know why. Whoever they are, they have to be able to say “Ack! Don’t do that.” in the proper tone of voice. Judy Dench if she’s willing? Unfortunately, LaWanda Page has passed. I would love to hear Aunt Esther reading these scripts. Hee, I misunderstood and thought you meant she had “passed” on the recording project, not that she had passed from this mortal coil. LaWanda Page passed away in 2002. Omg where can I audition for the role of Fergus?! Alternatively cool would be to have it narrated a voice artist who can bring our favourite office personalities to life; Jane, Wakeen, Fergus, Bob and all the rest of the gang. And teapot and llama sound effects. How about B.J. Harrison from The Classic Tales Podcast? And Lucinda, I couldn’t remember the other female names when I listed them above. OMG, it could be a Prairie Home Manager! Tour??? Will the be a tour???? Will you be at ALA? Will you be at BookExpo?????? I’m just imagining a bunch of AAM fans showing up to signings in cosplay – people in suits with Fergus and Jane nametags, a chocolate teapot here or there, some llamas, Duck Club t-shirts – and nobody else knowing what the hell is going on. …well, I know what my Halloween costume for next year will be. I shall come as Princess Tiana. I don’t think so, but I don’t actually know — we haven’t started talking publicity yet, although I imagine we will have to soon. My understanding is that book tours aren’t so much a thing anymore unless you’re a celebrity, but I’ll keep you posted! Wait, you aren’t a celebrity?!!?!? I would like a signed teapot. Right! would stand in all day for your signature!! A friend of mine recently had a book published and did a book tour. I’m pretty sure he’s not a celebrity, but his stuff is kind of niche. So it’s possible that you might get one since you are also kind of niche. If it’s something you want to do, the major independent book stores in the Seattle area (Third Place Books comes to mind) have several smaller authors doing events several times a week. Or maybe Cascadia is just full of weirdos, who knows. Minnesota . University of Minnesota Bookstore, magers and quinn, I KNOW people. 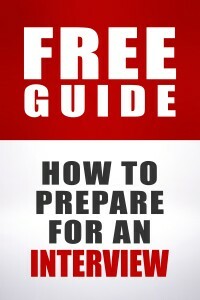 I wasn’t able to get the pre-order for the ebook to work but I’ll try the link at home to see if it works. Pre-ordered! Come to Portland and talk at Powell’s please oh please oh please!! I love Powell’s! And Portland. Wait, so will you be doing a book tour? Of the states, at least? See above — basically, I’m not sure, but I think book tours aren’t used as much as they were in the past. But once we start talking more concretely about publicity stuff, I will let you all know! Perhaps a contest for a location on the launch date. a NY Times reporting store. Pre-solds and a signing. yes, I know. keep my eyes on my own plate. or since you are local- Politics and Prose is the place. You have so many loyal AAM followers! I just pre-ordered the book. Would love to meet you in person!!! Portland loves you! Please, please, please come to Portland and talk at Powell’s! I live super close, and I could come hear you talk! Yes! Yes! Come to Powell’s!! Come into the city and speak at Politics and Prose! This this this this this! No tour needed! We have to wait until May 1? Now I wish I hadn’t pre-ordered the Kindle version! OMG! Don’t be a Fergus! That would be the best! In SFF land, bookplates are the thing, rather than sending books to and fro. The author signs an adhesive backed bookplate and it just goes in the mail. Might this be possible for AAM readers Please?? Indeed – I just saw a post from Jim Hines offering to do that this morning for his most recent. Seconded! It’d be great to have an option to buy a signed bookplate. I know cookbook authors do them, and other authors too. I love this idea. And I would love it even more if we could fill the bookplate design with AAM memes (llamas, rice, teapots, voodoo dolls?). Thank you for this … for some reason the wakeen/Joaquin story CRACKS me up. I think it is when the LW said that sometimes she said (in front of Wakeen) … “hey, we should talk to Joe-a-kin about this” It gets me every time! I’m on the other side of the world, so usually pre-order stuff off Book Depository — but is it more beneficial to you if we pre-order through the link you’ve given? Awesome — in that case, pre-ordered! Can’t wait! Yes!!! I’m in Australia and always use Book Depository. I also marked that it’s a “Want to Read” on Goodreads–are all those books under your author profile really you? I’m thinking you may be merged with another Alison Green. Ha, no. I’ll email them and see if they can fix that. Looks like it’s been sorted out now. Very exciting news!!! I’m making sure our library orders a copy (and will also put one on my Amazon list for myself). And everyone else — please ask your library to consider adding a copy to their collections. That way, people who might not be able to get the book for themselves due to their own budgetary concerns can still access this awesome info!! And Alison, if you do plan a book tour, I know my library would welcome you! We have a great indie bookstore in the city that works with authors to plan signings, etc. Good idea! I just became a member of my local library and loving it! I made a noise like Ron Swanson getting his shoes shined when I saw this post. Not to be a Fergus (ha! ), but if you’re preordering on Amazon, may I suggest using the link smile.amazon.com rather than http://www.amazon.com? You pay the same and Amazon kicks a few cents to a charity or cause that you designate. It’s an easy way for people to help out and the “few cents here, few cents there” really start to add up. Yes to this! And all your lists “wish list”, history of purchases, etc. carry over to the smile.amazon site. The checks my nonprofit clients get from Amazon Smile are small, and can’t replace your regular donations to the causes you love, but they are a nice bonus! I think any time would be helpful! Unless things have changed a lot in the past few years, basically all pre-orders get counted as sales on the day that the book is released, so pre-orders make a big difference in sales rankings. Very exciting, Alison! Way to go! Also, the extent of your fan base certainly warrants a tour of SOME sort. I will personally fuss at your publicist if they suggest otherwise. I pre ordered mine! I can’t wait! If you do a book tour, make sure to do BookPeople in Austin. They have tons of authors come through – big and small – and have almost daily events. It’s an incredible store! Also, if there is an autographed option, will you please post it? I would definitely pay to get a signed copy. Also, *loving* that the first ‘you may also like’ link is “my coworker self-published an X-rated book and won’t stop promoting it at work”. 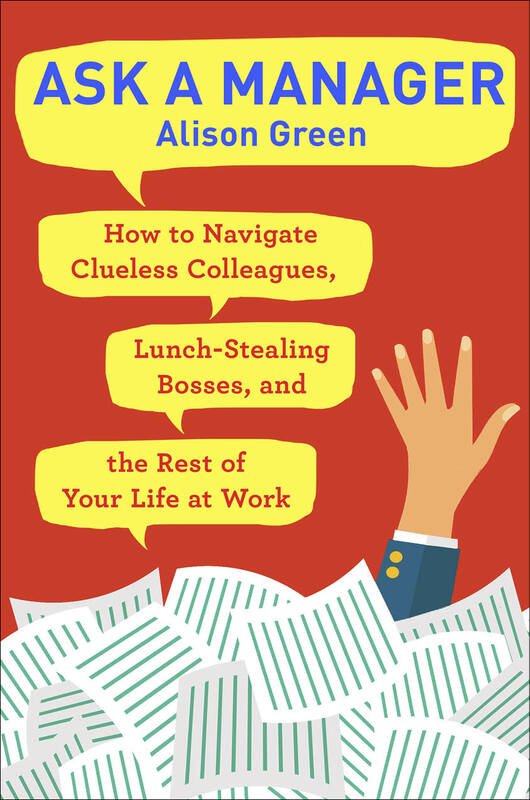 I can see an evil boss flipping through the book in the break room, deciding he doesn’t like it because he doesn’t want his employees to become “enlightened,” as it were, and removes it (either to throw out or to keep for himself). Just preordered! I am so excited!!! …tell myself to remember that good things come to those who wait and that patience is a virtue. …soon 152 days. Pre-Order already clicked. One of the easiest and fastest pre-orders I’ve ever done since The Cooking Gene. I will have to wait until closer to when it comes out. I can’t pre-order anything now. I’m a little embarrassed to admit this, but I’m tempted to buy a bunch of copies and just distribute widely. There is a trend now of doing commercially available signed editions. I don’t know if it’s a thing for paperbacks as much but since it seems like there’s interest you might ask your publishing team. I just pre-ordered. I can’t wait to read it. 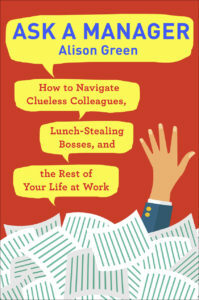 Question for Alison about your book – is an amazon.ca or walmart.ca pre-order available for Canadians yet? or is that still to come? Would love to pre-order, but at this time, the links seem to be only available for American shopping sites.